This vegetarian sausage is deliciously seasoned and matches well with, for example, cabbage dishes. In addition, this product is enriched with vitamins and minerals making it a full-fledged meal component. A delicious juicy sausage, which is also ideal to cook on the barbecue or stone grill. 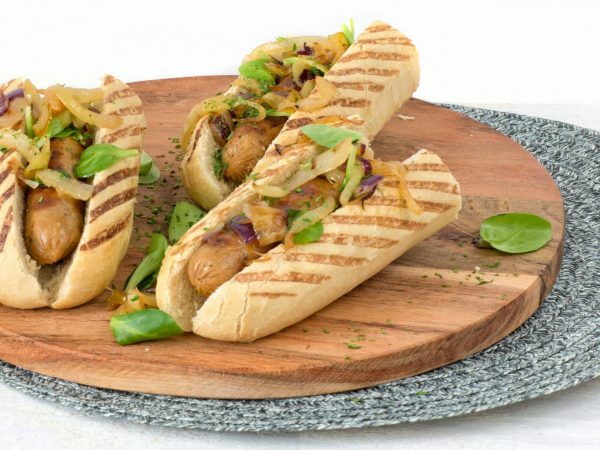 This vegetarian bratwurst is available in 50 and 80 grams and is also available in patties. Water, 11% vegetable protein (wheat gluten, soy), onion, rapeseed oil, egg white*, natural flavouring, starch (potato, tapioca), dextrose, salt, sugar, spices, colour (plain caramel), mineral (ferrous fumarate), vitamin B12. * Free-range eggs.